Mendocino is the only town on the California Coast designated as a Historic Preservation District. The settlement was established in the 1850s, with architecture reminiscent of a New England village. Many of the early residents came here from Maine and built grand Victorian mansions and quaint Saltbox cottages. 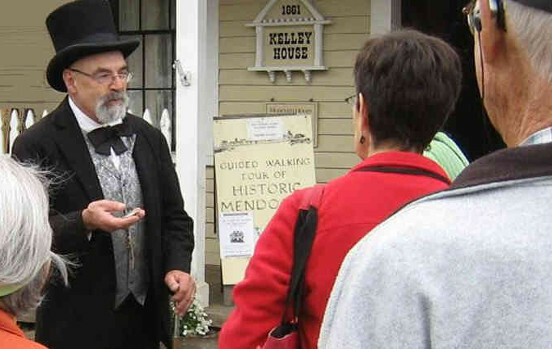 There is no better way to discover the charm and history of Mendocino than to take one of our delightfully informative walking tours. Whether you are a first-time visitor or a lifelong resident, you’ll learn surprising details (and even some secrets!) about the people, historic architecture and community spirit of this quaint town. Join our expert docents for a stroll and lively commentary. You’ll pass by early pioneer homes, historic meeting places and buildings that make up the National Historic District. Walking tours every Saturday and Sunday at 11AM. Tours begin at the museum. Meet on the Albion Street porch. Walking tour tickets make great gifts. Click below for advance purchase, $10 each, for pickup or postal delivery. Kelley House Museum, Inc. is a 501(c)3. Your donation may be tax deductible, as allowed by law. 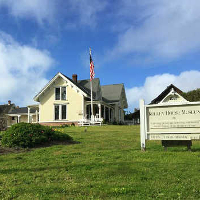 In addition to our popular guided walking tours, the Kelley House Museum has developed a self-guided multimedia tour of historic Mendocino. The tour is presented via an Android tablet, allowing you to stroll through the streets at your leisure and learn about the history of the Coast and town. Rental cost is $10 plus deposit. The Kelley House also offers commercial group tours. Contact the office at 707-937-5791 for more information.